Celebrate Oktoberfest on the Cuyahoga! From Sept. 24 to Oct. 3, Collision Bend will feature RiverFest beer along with traditional Oktoberfest fare including homemade bratwurst, sauerkraut, potato dumplings and Bavarian pretzels served with German-style mustards. 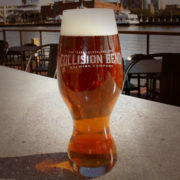 http://www.collisionbendbrewery.com/wp-content/uploads/2017/04/beer-tab.jpg 1213 1200 admin http://www.collisionbendbrewery.com/wp-content/uploads/2017/04/collision-bend-logo-b.png admin2017-09-13 08:49:432017-09-13 08:49:43Celebrate Oktoberfest on the Cuyahoga!